AI, PDF, EPS are preferred (Artwork fee may be waived). Other formats are acceptable. Created by our specialist technicians and designers our Sparx Trophy Plaques Range features colourful and modern designs. The range is engineered from non-shattering materials making them a perfect “child safe” alternative to other traditional plaque varieties. Sparx Full Colour Trophy Plaques come in a variety of shapes and can be customised to school colours, achievement or title. You can even include the recipient’s name on each individual plaque. 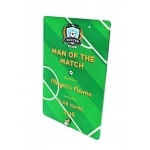 Plaques coming in 2 sizes (A6 & A5) and come with a display rod.